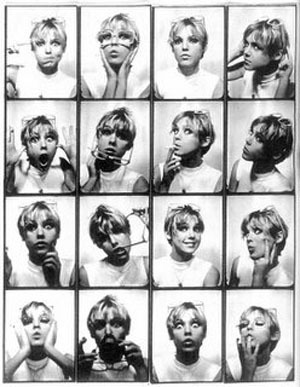 This photo series is of Edie Sedwick, a muse of Andy Warhol. She was a socialite who inspired Andy. He used her as a model for photos and short films. She quickly became an 'it' girl, ' known for her door knocker earrings and fashion statements. I love this photo-booth like picture. Its so cute and fun, it reminds me of pictures I take with my friends.